The William and Flora Hewlett Foundation defines deeper learning as “a set of competencies students must master in order to develop a keen understanding of academic content and apply their knowledge to problems in the classroom and on the job.” In the first of a series of reports about deeper learning, the authors provided a picture of the strategies and structures the adults in the sampled network schools used to foster deeper learning. In the second, they focused on the question of whether students who attended the selected network schools in the study experienced more opportunities to engage in deeper learning than would likely have been the case had they not attended the network schools. Did students who attended the selected network schools achieve better outcomes than would likely have been the case had they not attended the network schools? In particular, did they demonstrate improved outcomes in cognitive competencies, interpersonal and intrapersonal competencies, high school graduation, and postsecondary attendance, persistence, and selectivity? Were the impacts of attending a participating network high school similar for all students who attended these schools, or did certain subgroups of students (e.g., students with low and high levels of prior achievement) differentially benefit from attending these schools? On average, students who attended the network schools in the study achieved higher scores on the OECD PISA-Based Test for Schools (PBTS)—a test that assesses core content knowledge and complex problem-solving skills—than did similar students who attended non-network high schools. Students who attended participating network schools reported more positive interpersonal and intrapersonal outcomes than students who attended non-network schools. Students who attended participating network schools were more likely to graduate from high school on time (within four years of entering Grade 9) than were students who attended non-network high schools. Students who attended participating network schools and non-network schools had similar rates of enrollment in postsecondary institutions overall. However, students who attended network schools were more likely to enroll in four-year institutions and in selective institutions. Although there were significant positive effects of attending a network school averaging across the pairs of network and non-network schools in our sample, for many outcomes—for example, PBTS mathematics scores—the effects of attending a network school varied significantly across individual pairs of schools. Attending a network school had similar benefits for students who entered high school with low achievement and for those who entered with high achievement, particularly for the test score and high school graduation outcomes. However, while attending a network school increased the postsecondary enrollment rate of students who entered high school with low achievement, it had no effect on the postsecondary enrollment rate of students who entered with high achievement. Evidence of Deeper Learning Outcomes by Kristina Zeiser is licensed under a Creative Commons Attribution-NonCommercial-NoDerivatives 4.0 International License. 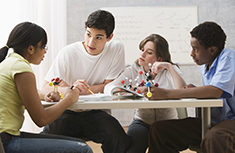 Students at high schools focusing on deeper learning had higher scores on standardized tests in mathematics and English, and higher graduation rates than their peers, according to a study by the American Institutes for Research (AIR). In conducting the Study of Deeper Learning: Opportunities and Outcomes, funded by the William and Flora Hewlett Foundation, AIR researchers found positive effects on students from a wide range of deeper learning approaches.